Before you take the time to read todays post, take the time to wish your Mom a happy Mothers Day, and let her know you appreciate all she does for you. Now that that's out of the way, lets talk about the not so familiar cap above. 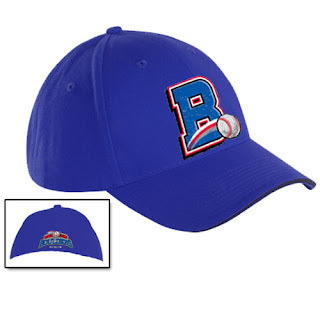 The hat you see, is what will be the home cap of the Rockland Boulders. I'm sure you may be scratching your head, while you question yourself "Who the heck are they?" The Boulders will be participating in their first season, in professional baseball as a member of the Canadian American Association of Professional Baseball (The Can-Am League). The Can-Am League, which is in its eighth season of play, welcomes three teams to their operations this summer. In addition to the Boulders, the Newark Bears, and the New York Federals will play in the league as well. The Rockland Boulders, who will be managed by former big league pitcher Dave LaPoint, will play in Pomona, New York at Ramapo Ballpark; a currently being constructed venue, which will hold just over 4,000 fans. As someone, who was born and raised in Northern New Jersey, this is most certainly a welcomed franchise, which will provide affordable entertainment for the whole family. Play for the Boulders begins on May 26th, with the initial home-stand beginning on June 16th, as stated on the teams official website which can be seen HERE . The teams home cap, shown above, features a blue crown and brim, with a capital B front and center. Additionally there is a baseball flying outwards. The cap can be found in the team store, which can be reached on the Boulders site linked above. Will the Boulders get off to a "Rocky" start, or will they experience some smooth sailing? Only time will tell, as play begins in less than three weeks. Now Play Ball! nice cap. Reminds me of the Buffalo Bisons cap though.